The tale of the tribe approximates a tale of humanity, or ‘tales’, a new global epic that must capture illuminating details from humanity and juxtapose them in a special way using special language (Hologrammic prose, the Hermetic style, Ideogrammic method, Joyce’s ‘epiphany’ etc.) Dr.Robert Anton Wilson crafted his tale of the tribe to suit, among other definitions; the architects of post-modem’ cyber-culture, reaching back to the renaissance and pulling up-tense to our decentralized–hyper connected–future present. During a six week period, I-fly will share his open interpretations of the tale of the tribe, performing an on-line multimedia vortex of signals, dialed into James Joyce, Ezra Pound, Giordano Bruno, Marshall Mcluhan, ‘Bucky’Fuller, and RAW himself. 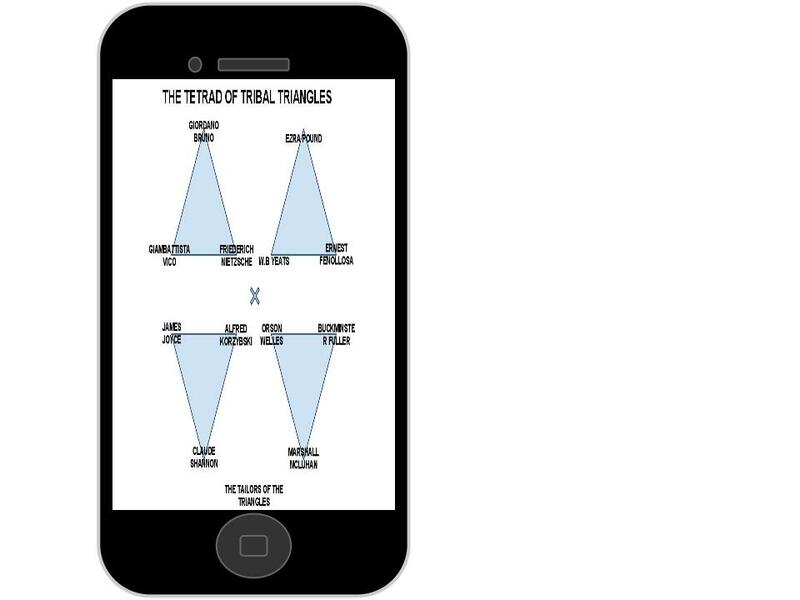 email to the tribe will reprocess communications from across time, and produce new maps, new metaphors, and mold new memes that help forward the tale of the tribe and the RAW wisdom oozing out from all quarters. Each week fly will provide a spread of multimedia for you to process, generally keeping in step with the program, encouraging a wide variety of conversation and focused feedback. Feel free to drop in and drop out, as you like. EMAIL TO THE TRIBE: WEEKLY PRESCRIPTION. The wheels of the tribe go around and around. WEEKLY DOSE: Decentralized and Rotational Map Warfare. WEEKLY DOSE: Vicosahedron and Canto LXVI. Open Source History. WEEKLY DOSE: Shannanigums Wave & Future Present. WEEKLY DOSE: Maybe Logic & RAW Multimedia. WEEKLY DOSE: Work of the tribe. email to the tribe. COURSE TEXTS: Recorsi by Robert Anton Wilson. This entry was posted in Bruno, BUCKMINSTER FULLER, Claude Shannon, Dr. Robert Anton Wilson, Ernest Fenollosa, Freiderich Nietzsche, Giambattista Vico, Internet, James Joyce, Marshall McLuhan, MLA. Bookmark the permalink.